The event on 20 and 21 March, now in its sixth year, aims to highlight the values in shifting towards paperless laboratory technology by developing a learning platform that can help organisations designing successful digital transformation projects. For the sixth edition, the organisers have proposed a journey through the whole data lifecycle focusing on four major areas of attention. Those are forming part of our 2018 central theme: ‘eConnect, eManage, eDecide, eArchive,’ explained PLA organisers Isabel Muñoz-Willery and Roberto Castelnovo. The conference offers free entry to attendees from any firm owning a laboratory that can benefit from paperless technologies and methodologies. Attendees come from a wide range of areas including pharmaceutical, lab services, biotechnology, food and beverage, consumer goods, cosmetic, chemical, and oil and gas. The combination of high-content presentations and interactive workshop sessions attracts an eclectic mix of experts from laboratory directors, operational excellence managers, IT business partners, QC and QA management, research departments and manufacturing specialists. Here, we introduce the sponsors of the 2018 edition of PLA, which make it possible to offer free registration to attendees. Lonza Bioscience’s MODA platform has become the standard for paperless QC microbiology for a number of global pharmaceutical and other regulated manufacturing organisations. It is a comprehensive solution for environmental, utility and product monitoring, combining automated scheduling, workflows, mobile data acquisition, device integration, and visual analytics. MODA eliminates paper-based monitoring and testing that can be expensive, error-prone, time and labour-intensive, therefore reducing timelines enhancing data integrity and potentially saving clients QC costs. At the Paperless Lab Academy the Lonza team will be available to discuss your requirements for moving to a paperless solution. They will also present a Case Study: Overcoming the challenge to achieve a fully integrated paperless workflow, while connecting manufacturing with QC. Thermo Fisher Scientific offers a complete range of laboratory software capabilities to fit all applications. Its solutions ensure effective management of labs from all industries and enable complete visibility and control of data throughout its lifecycle – preserving data integrity and driving compliance. It works with laboratories large and small to determine how software could be applied to streamline processes, expedite research and facilitate decision making. DEXSTR offers an approach that turns scientific data into knowledge. Using Artificial Intelligence (AI), combined with scientific public ontologies, Inquiro transforms unstructured data into structured and actionable information that can reduce costs and increase productivity. PLA2018 is a unique opportunity for DEXSTR to present how Inquiro helps scientists solve their data challenges every day. The DEXSTR team will show how to get the most out of unstructured data in a demonstration at their dedicated workshop. SoftNLabs is an IT services company that specialises in Lab Informatics (LIMS, ELN, LES, etc). It has strong experience of the main commercial solutions of the market and also develops specific software solutions and mobile applications able to work independently, or to be integrated to your information system. SoftNLabs can provide you with the right resources, from junior to senior profiles, during any step of a Lab Informatics project. Adiuto is an Italian softwarehouse specialising, since 1999, in design and development of DMS and QMS solutions. During PLA2018, Adiuto will present its solution called AdiPharma, specifically developed for regulated environments. Through AdiPharma, lifescience organisations can easily manage their documents and data in compliance with the regulatory prescriptions and maintain the governance on their processes. This is possible thanks to a solution that’s both easy to use and configure. AgiLab provides Unifed Lab Digital Platform for scientific data management and collaboration across R&D, combining Electronic Lab Notebook (ELN), Lab Execution System (LES) and Laboratory Information System (LIMS) functionality into a single innovative system. Built using the latest future-proof web technology powered by Oracle, AgiLab leverages technologies to secure, enrich and offer the latest ergonomic design concepts and digital connectivity. During the workshop, AgiLab will present advanced self-service data analytics with its embedded Analytics module. AgiLab will illustrate how to explore data by adding rich and interactive visuals with drag and drop to achieve compelling analysis and create an interactive story shareable across an organisation. Agilent provides analytical solutions to researchers ranging from sample prep to analysis with a strong focus on the pharmaceutical space and an integrated software suite to help capture, analyse and share data with speed and compliance. From data collection and analysis, to interpretation and management, OpenLab software is Agilent’s response to the complex regulatory scenario in which data integrity and software validation has an ever-increasing importance. Agilent is a specialist provider in CDS, ECM and ELN solutions enabled through enterprise services which provide capability to enable lab productivity optimisation and maximisation of asset utilisation. Dassault Systèmes’ BIOVIA brand provides a scientific collaborative environment with modelling, simulation, laboratory and quality management, allowing users to access, organise, analyse and share scientific, quality and process data in unprecedented ways throughout the product lifecycle, from early product ideation to manufacturing and commercialisation in regulated and non-regulated environments. BIOVIA Unified Lab Management connects people, resources, processes and data integrating BIOVIA applications, as well as third-party systems and instruments. It includes the Allotrope and the S88 industry standards, providing the basis for a common understanding and usage of laboratory equipment, materials and procedure steps within and between the different labs. Collaborative Drug Discovery (CDD) provides an intuitive informatics software suite extensively used by creative biologists and chemists working in academic, biotechnology and pharmaceutical settings. Their flagship product, CDD Vault, enables researchers to intuitively organise and analyse both biological study data and chemical structures, and to collaborate with partners through a straightforward web-interface. CDD helps scientists register chemicals, track inventory, manage bioassay data, capture experiments, calculate Structure-Activity Relationships (SAR), and mine their data for drug candidates. CDD was founded in 2004 and serves thousands of researchers doing drug discovery all around the world. LabWare’s Enterprise Laboratory Platform is a unique and proven suite of product capabilities that encompass LIMS, ELN and LES method execution in a single integrated and enterprise-ready solution. Its Enterprise Laboratory Platform combines LabWare LIMS and LabWare ELN, a comprehensive and fully-integrated electronic laboratory notebook application, which enables companies to optimise compliance, improve quality, increase productivity and reduce costs. LabWare mobile builds on more than 20 years of LabWare technology and experience as a global provider of enterprise laboratory data and information management systems. 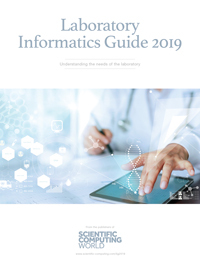 PerkinElmer Informatics’ focus is on redefining how labs embrace electronic data capture, cloud-based applications and collaborative tools to modernise research environments and deliver efficiency improvements. The firm’s suite of robust ELN solutions, TIBCO Spotfire, has powered advanced data analytics applications, and its new cloud-based PerkinElmer Signals platform helps scientists unlock the hidden knowledge within their scientific data, whether working independently or collaboratively. Thousands of scientists are benefitting from its solutions designed to support a wide range of disciplines, from R&D, to screening. Register for the workshop, eDecide: Delivering on the Promise of Enterprise Search & Analytics, and stop by their booth to learn more. Multi-level security is provided for every job – from assigning access privileges, password expiry and automated log-outs due to inactivity, to establishing audit trails and regulating new projects, and archiving of your Empower 3 data. As the Allotrope Framework architect, OSTHUS is part of a unique collaboration of analytical chemistry and software professionals working on the strategic development of long-term, open and sustainable lab environments. Experts in a partnering approach to guide you from business strategy to the successful solutions in pharma and life sciences, at PLA Osthus will present the updated Allotrope Framework and cover .adf files and how they are used. They will demonstrate semantic modelling in .adf (OWL models + the SHACL constraint language). You can find out how the data description layer in .adf can be extended via a ‘semantic hub’ which can be used across the enterprise. Customer examples will be given where possible. Also, they will show connectivity of semantic reference data to statistical data science – a novel approach they call Big Analysis. Open-Co is joining PLA2018 to talk about data and quality control from a new perspective... a matter of projects more than products, bringing to light innovative points of view and tailored solutions, from LIMS to IoT. Open-Co is specialised in the planning, development and implementation of LIMS software and applications for the technical management of testing labs, quality systems and production control. Product innovation, flexibility and customisation of solutions, customer support in both pre and post-sale phases are the values of Open-Co’s everyday activity. Their solution: Prolab.Q is the new-generation LIMS software designed to satisfy the needs of small, medium and big testing laboratories – in different fields of application and technical sectors. Advanced Chemistry Development (ACD/Labs) is an informatics company with more than 20 years’ experience developing and delivering commercial scientific solutions in support of R&D. The ACD/Spectrus platform uniquely unifies and assembles analytical and chemical information in chemically intelligent software to deliver productivity solutions that foster collaboration and support scientific innovation. Spectrus integrates with analytical instruments (from various techniques and vendors), and supports automated and manual data processing, analysis, and management of live spectroscopic, spectrometric, and chromatographic data. Select applications on the platform also allow data capture and instrument control. Their visualisation tools support decision-making from assembled, interpreted data and ensure line-of-sight through a product’s lifecycle. Biodata’s product ’LabGuru’ provides management of structured and unstructured laboratory data, processes, entities and documentation in a single web-based IT platform which can be rapidly deployed with minimal services effort, either online or on-premise, on a wide variety of devices. The LabGuru ELN element provides an unrivalled compliant experiment documentation and protocol management function, whilst the LabGuru INVENTORY element provides integrated configurable management of diverse entities, from biologicals, such as plasmids, antibodies and cell lines, through to small molecule registration and management of reagents, consumables, lab instruments and colony management. BioData’s clients range from small to medium-sized biopharmaceutical companies, right through to top 10 pharmaceutical companies with more than 10,000 scientists utilising the platform. ICSA is a Spanish company that has developed a hybrid hardware-software solution for real-time monitoring of different sensors in labs. It can be used in clinical sample tracking using for the transport from the extraction units to the laboratory hospital. The samples can be receipted automatically using RFID labels and be can control the position inside de laboratory. All the features are developed using cloud computing software. STRATEC Biomedical is a strategic partner for medical equipment companies needing complex biotechnology systems. The original equipment manufacturer (OEM) builds analyser systems for third-party companies in the clinical diagnostics and biotechnology industry. STRATEC Biomedical develops software which is used to interface laboratory instruments involved in diagnostic testing. These solutions range from simple connectivity solutions, through to large middleware installations. In most instances STRATEC works with its OEM partners to develop customised instrument software solutions. With more than 20 years’ experience of delivering effective solutions, Wega Informatics has become a quality service provider for the Life Science R&D and IT sector. Services and solutions provided by its Biotech/Pharma R&D process experts and IT specialists support and enhance Life Science activities for the whole drug development process, from early research in labs to submissions to authorities and product marketing. This is complemented by a broad knowledge and experience in delivering and controlling compliance and quality of IT systems (GAMP, GxP and CSV). Aurora Vigilant is a maintenance software package which enables the laboratory to actively manage and electronically document critical tasks throughout the laboratory. Aurora Vigilant enables easy paperless record keeping, and can provide alerts to ensure action is taken to avoid non-conformities and potentially damaging instrument ‘down-time’. Zifo RnD Solutions is a fast-growing global organisation with offices in US, UK, India, France and Japan. It helps organisations strategise, design, implement and support their systems in the areas of laboratory informatics, scientific data management, clinical biometrics, genome informatics and compliance solutions. Zifo works with customers from more than 20 countries, including seven of the Top 10 global Bio- Pharmas. The company has been ranked as one of the fastest growing technology firms for six consecutive years (2012 – 2017) by Deloitte, and has been recognised as a ‘best company to work for’ in India in 2016, by the Great Place to Work Institute, and as one of India’s Great Mid-Size Workplaces – 2017; a study conducted by Great Place to Work Institute India in association with MINT, by HT Media. Accenture Scientific Informatics Services combines LabAnswer’s scientific and laboratory informatics expertise with Accenture’s strategic and business consulting capabilities, industry platforms, innovation approach and global scale, to revolutionise how scientific and laboratory processes are conducted across a variety of industries – helping make them faster, more efficient and more effective than ever before. The firm works with clients from the earliest stages of strategic planning through to implementation and support. With the acquisition of LabAnswer, it will help clients apply digital technologies to revolutionise scientific and laboratory processes. Accenture Scientific Informatics Services helps companies better capture, manage, integrate and analyse complex laboratory and scientific data to improve the discovery, development and manufacturing of new products, improve quality, reduce time to market and improve operational efficiency. Optibrium provides software for compound design, optimisation and data analysis. Its lead product, StarDrop, is an integrated suite of software enabling you to deliver optimally balanced, successful compounds, fast. StarDrop brings confidence and intuitive simplicity to decision making; guiding and validating the direction taken and which compounds you prioritise. It works by evaluating your project’s complex data, which is often uncertain because of experimental variability or predictive error. Its interactive tools then enable you to efficiently explore ways to further improve your chosen compounds. With its highly visual, easy-to-use interface, StarDrop guides your decisions through each stage of the compound selection and design process.